Bali Activity Serangan Surf School offer many kind of fun activity. 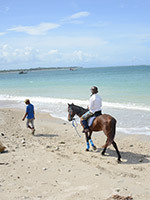 At this time you can try horse riding and walking along beautiful Serangan beach. They provides easy 1 hour course and 2 hour enjoyable course. 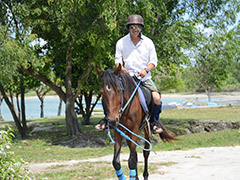 Hiro-chan offer reasonable package which horse riding and marine sports special set menu. ・The price for per person. Please booking with over 2 people. ・This horse riding plan can be 5 people at same time. 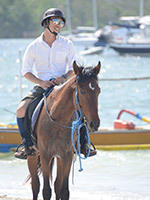 ・Due to reservation status, Horse riding guide might 1 guide for 1 group. 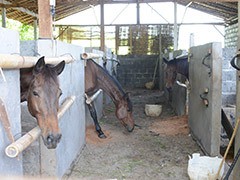 ・Due to weather, the riding course might be short or change course. 3．Introduce guide & horse. Orientation for horse ride. 4．Horse riding start. 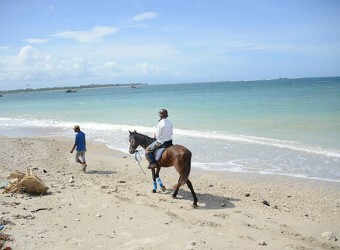 Horse riding at the beach. 5．Back way. If you getting use to you can run maybe? PT. Serangan Surf at calm beach, Serangan. There are 6 horse. This activity can be 5 people at same time. Horse riding instructor will support you. Rental item included helmet & rental gaiter. Please choose your size. Follow country road to beach Walking at Serangan beach. Turn at pole to back. PT. Serangan Surf at calm beach, Serangan. There are 10 horses. Horse riding instructor will support you. 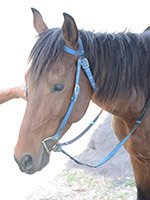 Please booking with over 2 people * Horse riding can be 5 people at same time. ・Transport time during 8:00-14:00. Please let us know your request time. 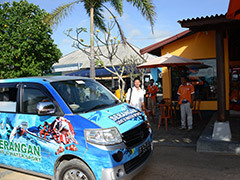 ・Free transport for Sanur, Kuta, Seminyak, Legian, Jimbaran, Nusa Dua. 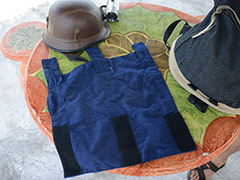 Long Pants, Shoes, Towel, Hat, Sun Screen, Sun Glass, Fee for Drink, etc.